In the InLoox PM Options, you can define groups that are available in every InLoox PM projects on the project pages Planning, Time Tracking, Budgets and Budget Overview. The groups help you to structure the data in a more meaningful way and allow an ongoing automatic comparison between time tracking entries, planning elements and budget positions. They can also also carry a currency code. Under General options click Groups. On the right side you will see the Groups area. The existing groups are displayed in the Groups list according to the order in which they appear in the InLoox PM projects. Double-click the entry that you want to change or click Edit. You can change the groups order by clicking Up and Down. The selected group will be moved one position upwards or downwards. The currency is not automatically redenominated. If, for example, € is replaced by $, InLoox PM does not recalculate the amounts, but simply changes the currency symbol as if the rate of exchange were 1:1. 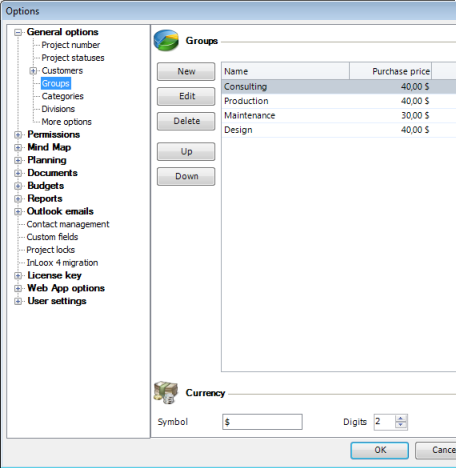 How to create and edit project groups in InLoox PM 7 • Copyright 1999-2019 © InLoox, Inc. All rights reserved.